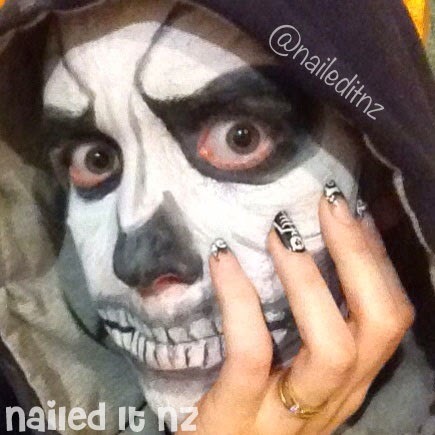 Skeleton Nail Art & Face Paint - Plus FAMOUS Nails! 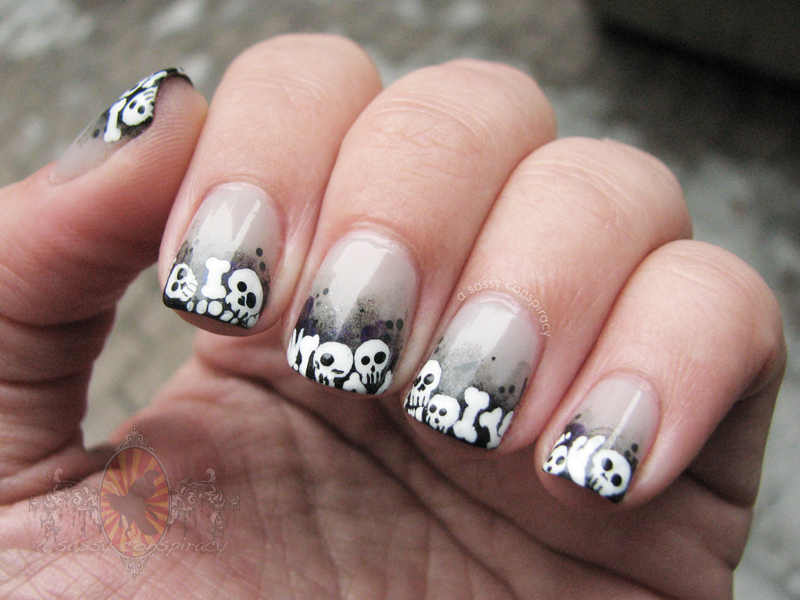 A few days ago I painted some skeleton nail art on my nails and posted a picture online. Oh. My. God. It blew up the internet. In my two-and-a-half years of nail blogging I have never experienced anything like it. Currently, this picture has 1,700 hearts on We Heart It, 1,000 on Instagram and 500 on Facebook. I got about 1,000 new followers out of it, was featured on Tumblr and heaps of Instagram accounts (including @nails2inspire) reposted it with credit. It was nuts, but in a very good way. The best part was, that after months and months of constantly making tutorials for other people, I did these purely for ME. Because I wanted to wear them. So to end up with nails I liked plus having half the internet drooling over them, it was a pretty good outcome. It also really reiterated that I'm doing the right thing by focusing on what I love, rather than forcing myself to be a tutorial-making machine. Here's the design! I had been thinking for a few days about what I wanted to dress up as for Halloween, and how I was going to match my nails to it. I've done a bunch of Halloween designs on YouTube, but I wanted something different; something that I hadn't done before. I was quite keen on a skeleton, and found a bunch of ideas online where the skeleton crossed over two nails - I definitely had to go with that! In the end, the biggest inspiration for those nails was this design by The Nailasaurus. I added a bit more detail to it though, around the hips and the skull and added some cracks across the whole design to make him look more realistic. After doing the skeleton, I decided I wanted a Halloween version of French tips on the rest of the nails. I found this cool design to inspire me, but had an absolute nightmare of a time trying to figure out what the name of the blogger was! If you clicked that last link you would have seen that it was very blurry, and seeing what the watermark says is completely impossible. However, after about 10 minutes of searching for different sizes of the picture I finally found one of a good enough quality that I could read the little writing on the watermark. Turns out I recreated a design the was a recreation itself! I initially saw A Sassy Conspiracy's photo, and after a bit of searching found that she followed Brush Me Blush's tutorial. If you're wondering how I did these, I'm afraid I won't be making a tutorial for these any time soon. You can follow this tutorial for the tips though, and all I did extra was to add some fine black lines around the bones to make them look cracked. 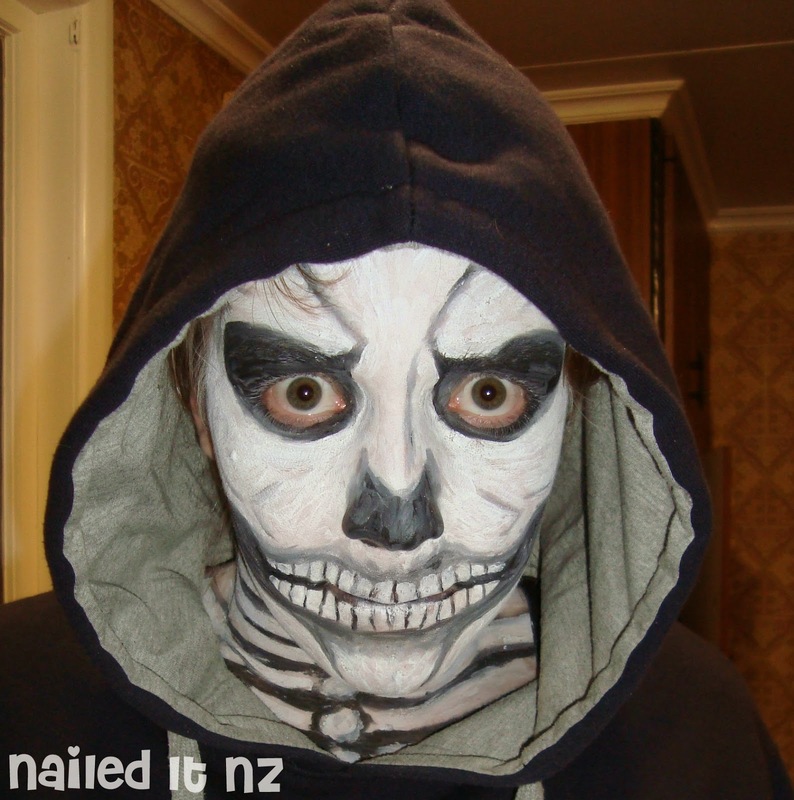 For the skeleton, I painted on the basic shapes and lines with white them dotted/striped in detail with black polish. They're not that hard, in comparison to my Disney series at least - that's why I was so surprised they went so viral! Their cute factor is through the roof, I guess. I've still got these on, and even managed to get away with using acetone on a client's nails this morning without removing any of my nail polish - win! Here's my other hand. I've got a video all about painting your nails using your non-dominant hand if you want some tips. Now, on to the face paint! I haven't ever done this before, so wasn't too sure how it'd turn out. I opted for a skeleton, of course. Considering I'm unrecogniseable in photos, I think I did okay! Chris made himself a Vampire, but one with a tanned neck, haha. I have issues with ribs. I added them in last-minute and didn't bother thinking much about their placement or how many there should be. So yeah, lots of ribs. My poor crushed lungs. 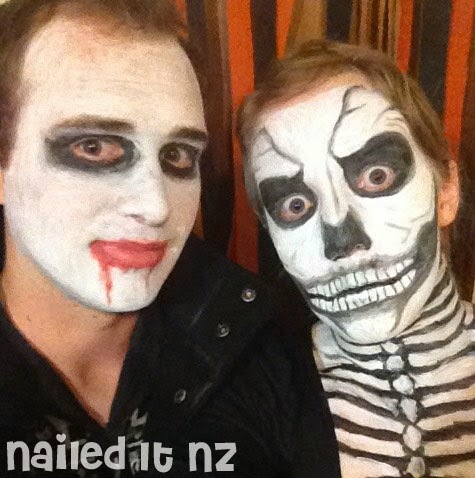 We had heaps of other cool dress ups at our Halloween party last night, it was a really good time. I've never celebrated Halloween before, but this first certainly won't be a last! Next week I'm planning on doing some Maleficent nail art, which will be part of my Disney series. Can't wait to show you what I come up with!